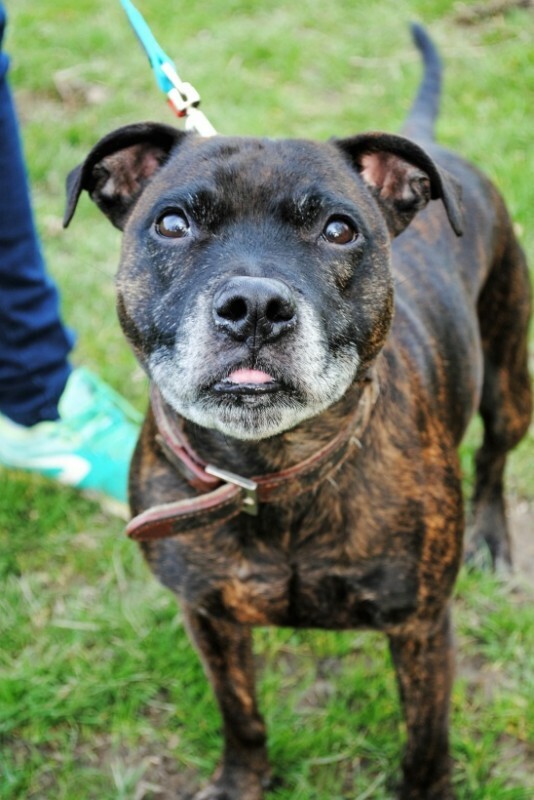 Burt is a real superstar, he is 7 years young and a small ish sized Staffy (17kg) – his tongue is a little too long for his mouth so often pokes out, very cute! He is very sweet, really friendly with everyone he meets and quite steady. Burt is currently happily living in a foster home with another dog (a male Lab) and cats. He is also good with children. 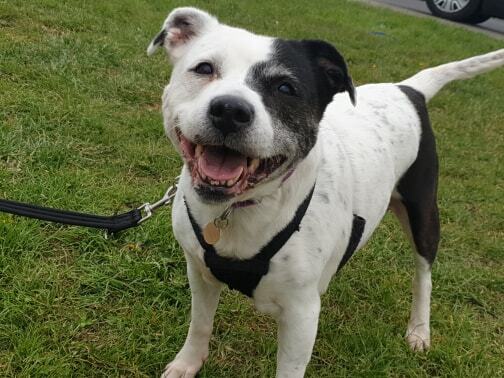 Burt loves his walks and to play with his football and sticks in the park, he is still quite active and would need a good couple of walks a day. He walks very nicely on the lead, and is good off lead. In the house, he is housetrained and used to being in a crate when left. He can be left for a couple of hours, but needs a home where he won’t be left for any longer than 3-4 hours a day max. Burt is such an easy going, happy little lad who will make an absolutely brilliant addition to a family. This entry was posted in Good with cats, Good with dogs, Good with kids, Happy Endings, Male, Medium by Amanda HYPS. Bookmark the permalink.